Although the Black-legged Albatross is found in Canada, it never sets foot on Canadian soil. They are pelagic birds living their entire life on the open ocean except when stopping in Hawaii to reproduce. If you want to find an albatross you have to go far beyond where whale watchers and recreational fisherman venture. The 128-foot M.V. Frances Barkley – one of the few Canadian vessels suitable for a boatload of determined birdwatchers heading to the continental shelf – does this trip once a year from Vancouver Island’s Ucluelet harbor. It had taken me three years and the tracking skills of a bloodhound to get a spot on this voyage and I wasn’t missing it. I set the alarm for a time I used to come home at and tried to sleep. I dreamt of wandering albatross but rose before the moon had set and rushed to the harbor. People wanting to see pelagic birds must get up before the moon sets. 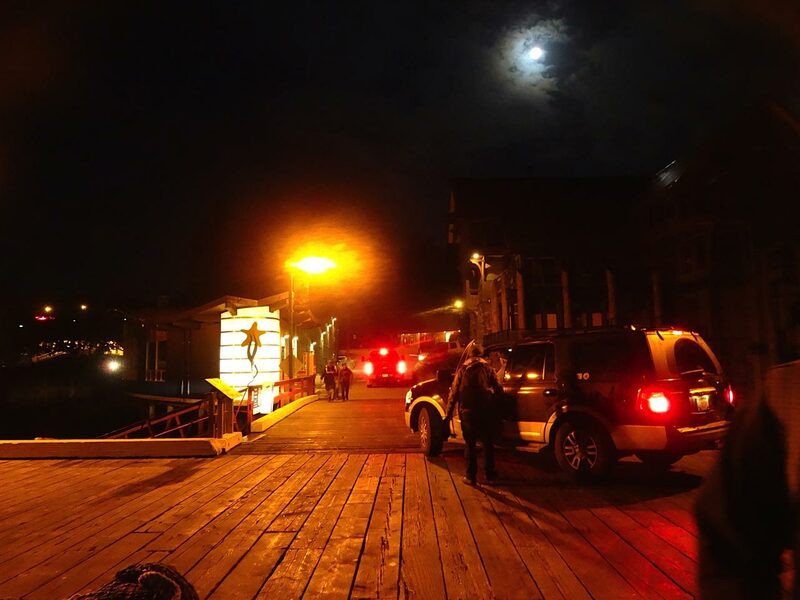 I skidded to a stop behind a long line of rain-suit-clad people snaked around the dock; people chatted quietly as they waited patiently to board. Birders are nothing if not polite and punctual. There was excitement in the air – or the bird watchers version of it – as people shared their hopes for sightings. “I’d love to see a Short-tailed Albatross,” sighed the woman next to me. Another woman chanted “Al-ba-tross, Al-ba-tross!” in a football style chant as the boat pulled away from shore. Sunrise revealed pale-grey skies as the boat chugged along the sheltered harbor. It seemed a great day to be on the water until the boat hit the open Pacific. Within minutes we were riding two-meter swells; the boat’s bow pointed at the sky before dropping four meters to point at the ocean floor. Soon I heard the sound of retching. Luckily it wasn’t coming from my own throat. I picked a spot on the railing mid-ship where I could look to the horizon from the side and refused to look at the bow or the stern so I didn’t remember what a pickle I was in. Preparing fish chum to throw overboard and attract birds. With eight hours of rough seas ahead of me how would I survive the day? Our group leader staggered by before throwing up in a garbage can and then collapsed on a bench to recover. Chatting with other people still upright seemed a good way to keep my mind off the ones who were dropping like flies. A hearty soul smiled and said, “These are good conditions for sea birds. They like the wind lifting them over the waves.” I learned the brown, seagull-sized birds skimming over the waves were sooty shearwaters and they fly all the way to Australia or southern South America to nest. After watching shearwaters for a couple of hours, the number of birds near the boat dwindled to nothing. My legs ached; I was hungry – in a nervous kind of way – and bored. I was afraid to wander the boat for fear I’d join the people vomiting. Someone muttered that our tour leader should have directed sick people to the back of the boat instead of leaving everyone to fear the wingless vomit comet! 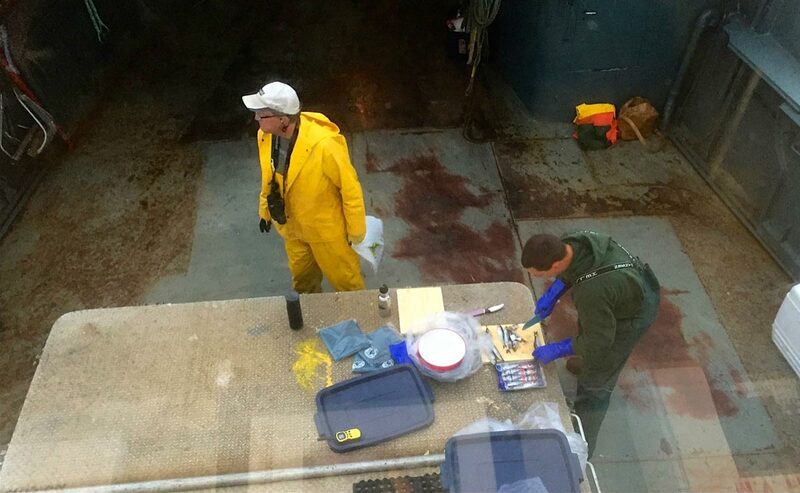 Bird watchers strain to identify the pelagic bird species found over the continental shelf. Slowly, the fog lifted and I spotted a fishing trawler on the horizon. We had reached the continental shelf where deep ocean upwelling brings fish to the surface. Screams of thousands of birds filled the air and people raced to the railing, binoculars glued to their faces as the show got underway. Two volunteers threw fish chum overboard to attract birds and the captain steered the boat in a sweeping circle so we would have better views. “Albatross on the water!” “Skua on the horizon” “Parasitic Jaeger at 9 o’clock” called out our guides as birds were spotted in the fray. In the heavy seas I struggled to focus my binoculars in time to identify most birds but I could see albatross. Several bobbed on the ocean looking like giant brown seagulls while others soared over waves, their almost seven-foot wingspan lifting their sturdy bodies with minimal flapping. It’s estimated an albatross flies over two million kilometers in a four-decade lifetime, drinking seawater and finding food sources with its keen sense of smell as it goes. Superstition says albatross carry the souls of dead mariners. Killing an albatross brings bad luck but to see one is good luck. I felt lucky to have watched this avian show on the edge of Canada’s water wilderness. Many people never witness this, including a few unfortunate people on our boat still passed out on chairs and tables below deck. As the boat spun around in circles people helped each other sight the birds they were seeking and the sky and the mood lifted. The sun shone brightly as guide Ilya Povalyaev – hoarse from screaming out bird identifications – bellowed out “flesh-footed!” with the same urgency as an announcer calling a Super Bowl touchdown. Bewildered, I asked the person next to me what the fuss was about. “It’s a shearwater species. A rare sight,” he concluded. The flesh-footed bird was too fast for my binoculars but I wasn’t bereft. I’d found my albatross and the sea was becoming calmer. I’d make it back to shore with my dreams and my stomach contents intact. I headed in for lunch as the boat started for home. People from around western Canada line up to board M.V. Frances Barkley. The M.V. Frances Barkley waits at Vancouver Island’s Ucluelet harbour. Fog often blankets the west coast of Vancouver Island. Birds are attracted to fish waste from boats. Photography buffs prepare for the perfect albatross shot. Two black-footed albatross bob among other smaller pelagic birds. Pelagic birds spend almost their whole life at sea. 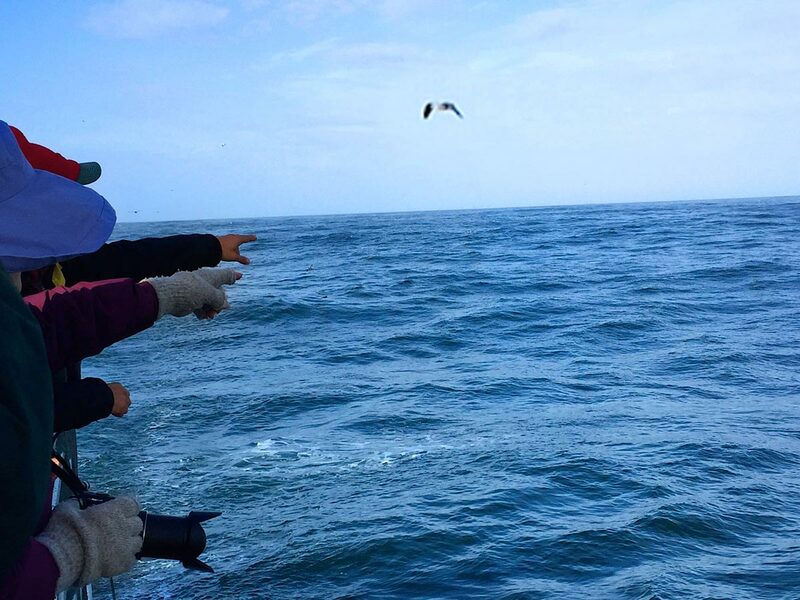 Spotting birds on the open ocean requires teamwork. People gather on the bow for a better look. The M.V. Frances Barkley returns to Ucluelet after a successful trip. Hiking Ucluelet’s Wild Pacific Trail helps get your land legs back after a big sea voyage. The M.V. 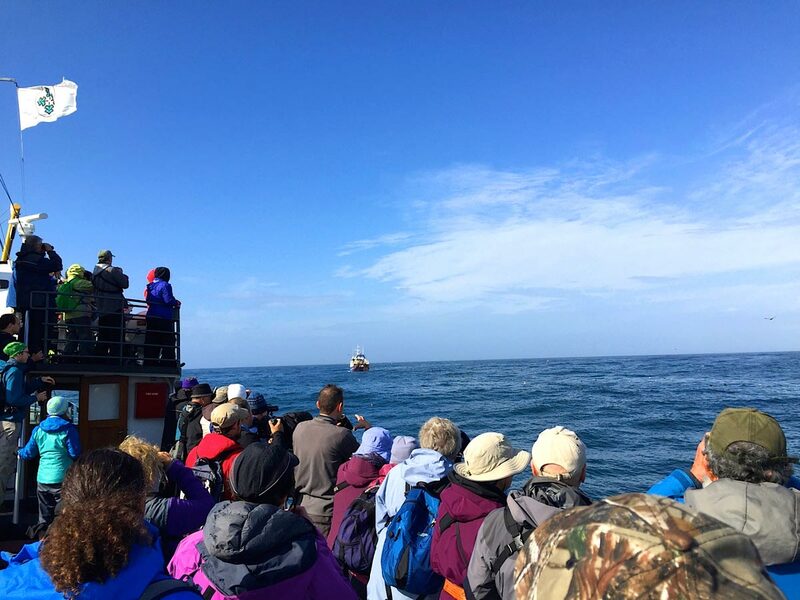 Frances Barkley does one trip a year to see pelagic birds. Contact groups such as The Edmonton Nature Club www.edmontonnatureclub.org or Wild Research www.wildresearch.ca for dates and info. 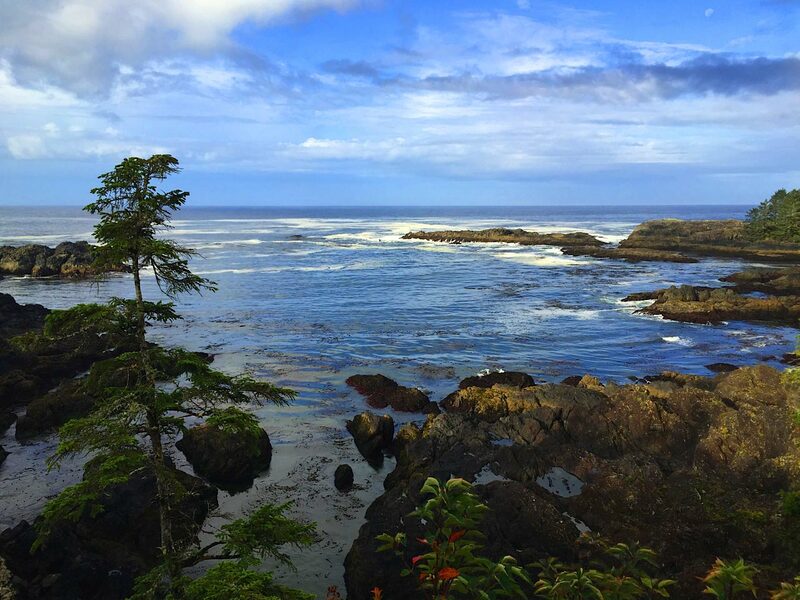 … Plan to stay in Ucluelet before and after the trip. Reef Point Cottages are close to the Wild Pacific Trail and Terrace Beach (great for watching west coast sunsets). Kitchenettes and barbeques reduce food costs. Book well in advance as rooms fill quickly in fall. … Get your land legs back by hiking Ucluelets’s Wild Pacific Trail and look for birds and marine life from shore. Allow at least two hours, more if you are a photography buff. Creating a Flying Zoo program in the 1980s where her Cessna 172 passengers had fur, scales or a beak, Carol Patterson’s adventures spurred her to leave a career as an oil and gas accountant to see the world’s wildlife. In the quarter century since, she has inspired everyday explorers by writing and speaking about being chased by elephants in Africa, sliding through bat guano in Borneo, and breaking her ankle in Bhutan. When Carol’s not writing about the best of Canadian wildlife trips, she daydreams about spreadsheets. 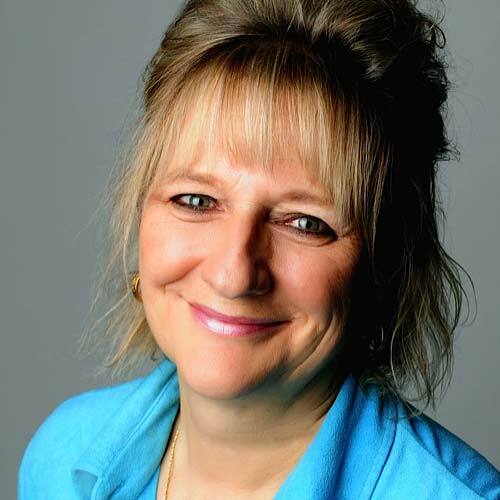 Carol Patterson is a two-time winner of the Travel Media Association of Canada’s award for Best Environmental/Responsible Tourism Feature. She can be reached at www.carolpatterson.ca and Instagram: thecarolpatterson.